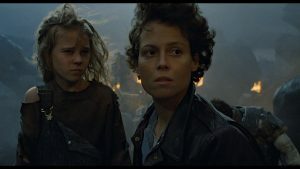 45: Aliens – Kyle’s Birthday Spectacular! The conclusion of our birthday specials! We’re stepping away from current nerdy topics and indulging in our all-time favorites. Kyle’s pick is the James Cameron film, Aliens, the 1986 sequel to Ridley Scott’s, Alien. Kyle gives us a little background on the original film before launching into the genre of military science-fiction, the influence of Robert A. Heinlein, and the fight to put women in space. This was a notoriously difficult movie to shoot, and Claire covers Cameron’s fight to enforce his vision on set, as well as the impact that this piece had on its genre and women as action heroes. Our hosts conclude with their thoughts on the movie, the franchise, and Cameron’s female superheroes.